My latest, and I dare say greatest (at least in this new issue), Mockingbird page yet. 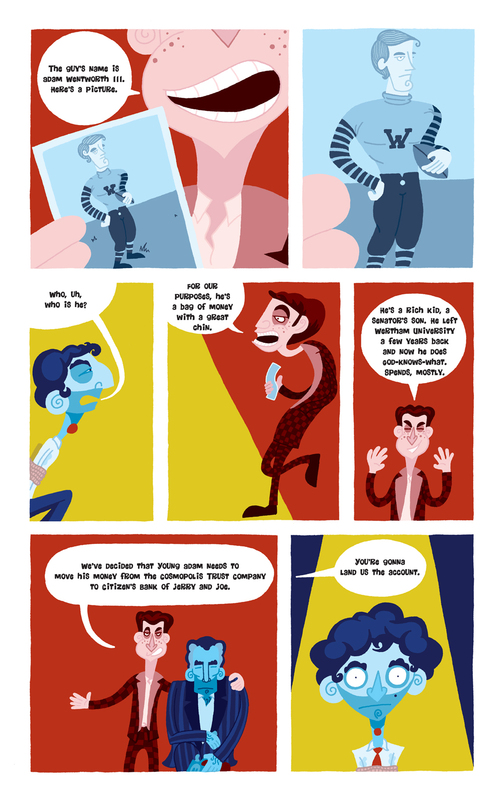 This is the fourth page of the second issue. Progress on that book is slow but steady and I should be running the finished story in May. For now, it’s just another textless page to keep y’all interested but still a little in the dark. Here’s another mostly-finished “Mockingbird” page, sans text. It’s my least favorite so far, but it’s come a long way since I first scanned it. Specifically, I’ve had to do a lot of painstaking redrawing with the track pad, reworking facial expressions and keeping Irving’s ‘fro in check. I’m thinking about adding some sort of emanata or background motif to indicate Jerry’s mounting anger. Maybe some stylized flames, jagged lines, or little darts of rage that radiate from him as he fumes. They could slowly invade the middle tier, finally catching Irving’s attention in panel six, when Jerry interrupts his monologue. I’m not sold on the idea, but I’m considering it. What do you think? Here’s the second page of my new “Mockingbird” book. 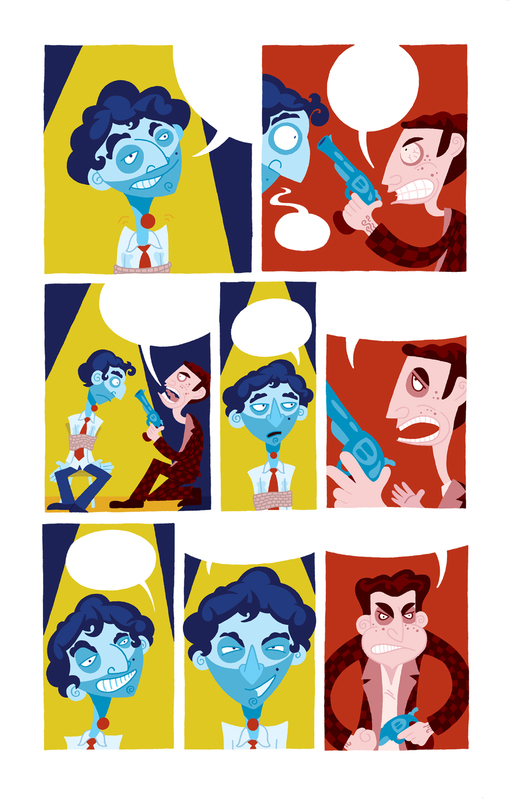 These colors are a lot closer to what will be appearing in the print version. 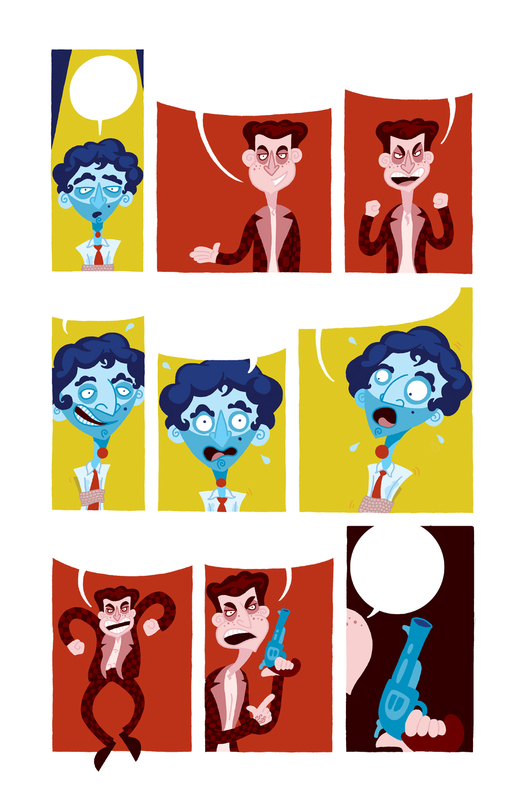 The page I posted last week looked a little garish, as the CMYK color read weirdly online. 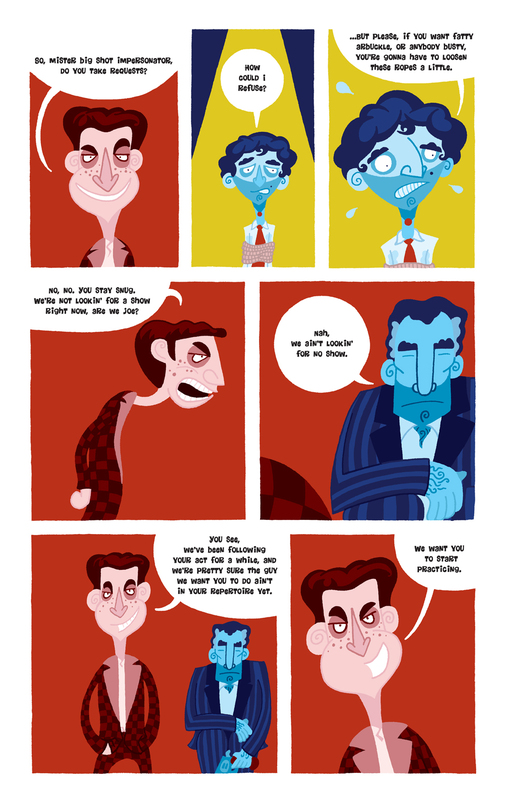 I’ve skirted that problem by creating RGB versions of my pages to post here. I’ve even gone back and replaced last week’s page with an RGB update. 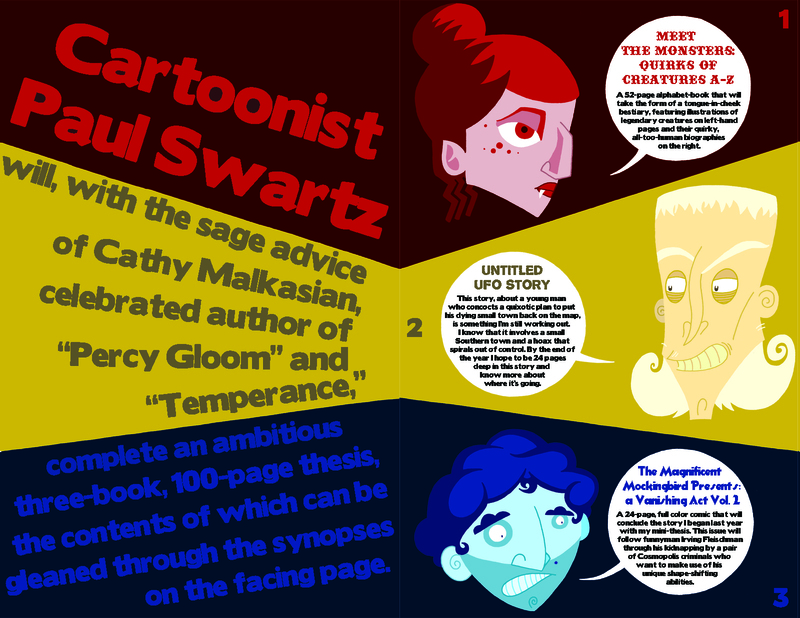 The text in this page (and last week’s now) is crisper too, as I went ahead and laid that in with InDesign. I’m still not sure what font I’m going to use for this project, though. I like the one I’ve been using so far, but it has its drawbacks. for instance, it has no capitol “I.” If you look closely, the gangsters’ mark is actually Adam Wentworth 111, the cutting edge, perhaps, in Electro-heirs. I’m pretty pleased with how these pages are looking so far. They’re a little spare, and heavy on the talking heads, but I’m mostly enjoying the simple style and the designs I’ve come up with. Someday, though, I’m going to have to learn to use Illustrator. This stuff just takes forever to do in Photoshop. As much as I love putting these pages up, I realize that if I want to serialize this story properly later, I’ll need to hold something back now. Maybe I should just start blacking out the words, a la redacted FBI memos. I’ll keep posting pages, but I might revoke you guys’ story clearance until I’m ready to release the full issue. This page is not quite finished. You can expect the final to include some minimal backgrounds (maybe just some texture to situate the characters against walls or something) and make use of a different font. Still, I wanted put this page up to show that, in addition to the monster alphabet and the UFO story, I am hoping to finish the second “Mockingbird” book by the end of the school year. Collectively, these projects are going to comprise my Master’s thesis. …It’s a weird world we live in. Now, after months of warily circling the pool, I’m diving back into the “Mockingbird.” It feels great. To mix metaphors a little bit (but still stay in the water) it’s kind of the warm bath of my thesis books, the comfortable one, the relaxing one, the one to unwind with at the end of the day. Still, as comfortable as the “Mockingbird is for me to work on, I’m shaking it up quite a bit. I’m using my new “no black lines” (I really need a name for that) style in all my thesis books, but, in “The Mockingbird” I’ve dispensed with lines (of any color) almost completely. The world of the Irving Fleischman is one of pure shape and color. I like this new style, it gives the project the look of having been made with cut paper. On the downside though, it’s just one more thing slowing down my already glacial process. Also, it’s a pretty stark stylistic departure from book one. In any case, I’ll be sticking with it for now and will be posting more pages as I finish them. A few weeks ago, while in Pittsburgh for a convention, I was thrilled to get an e-mail from a friend telling me that I’d been reviewed by The Comics Journal’s Rob Clough. I was doubly thrilled to discover that it was a very positive review! Clough has lately been reviewing all the CCS mini-comics that we gave him at MOCCA in April (what a backlog he must have!) and it’s been so much fun for us to see. Unfortunately, this delay means that the review didn’t link here (as the People’s Republic was then only a gleam in its founder’s eye), but to my old Flickr page. Also, the Mockingbird art pulled from there was not from the final book, but from a version of it I had been working on before I came to CCS. I cringe a little bit every time I see it, but still, no press is bad press! I’m planning on sending Clough a completed “Mockingbird,” as I only gave him a preview book at MOCCA. Also, for anyone who was wondering, there is a second issue on the way. I’m not sure when it will be done, but I’m about five pages in right now.